Print, scan, and copy from nearly anywhere with the HP OfficeJet 250 portable printer. Easily connect to your printer with Bluetooth® Smart technology and Wi-Fi Direct®. This quiet workhorse has a long battery life and delivers the most pages. Ideal for mobile professionals and telecommuters who need a reliable, portable, all in one mobile printer they can take virtually anywhere. This durable, compact all-in-one fits in your car or backpack for convenient printing anywhere. 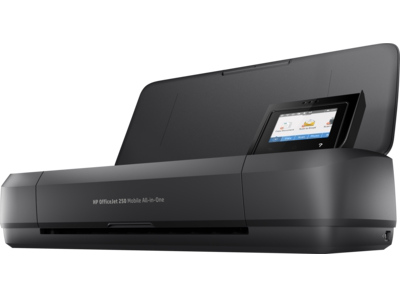 Main functions of this HP all-in-one mobile printer: scan, copy, fax, easy portable printing wherever you need it, wireless print from your laptop or mobile devices, color touchscreen, automatic document feeder. 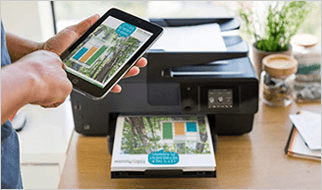 Mobile printing capability: Connect to your printer with Bluetooth® Smart technology and Wi-Fi Direct®. Download the HP Smart app and easily set up this wireless printer, scan documents with your camera, and print from social media or the cloud, such as Google Drive and Dropbox. Reduce charging interruptions with a long-lasting battery. Plug in your AC power source to charge within 90 minutes while the printer is off. Use the 2.65-inch color touchscreen to print, scan and copy quickly and easily. Use Original HP 62 ink & HP 62XL cartridges for great results print after print. Original HP ink prints up to 2x the pages as refilled cartridges. Paper sizes supported: Letter, legal, statement, executive, envelopes (No. 10, Monarch, 6 3/4 in), cards (3x5 in, 4x6 in, 5x8 in), photo (8x10 in, 5x7 in, 4x6 in, 3.5x5 in). What's in the box: HP OfficeJet 250 Mobile All-in-One Printer, HP 62 Setup Black Ink Cartridge (~200 pages), HP 62 Setup Tricolor Ink Cartridge (~120 pages), Software CD, Setup Poster, Power Cord. Media Size A2 Envelope; Japanese Postcard; Legal - 8.50" x 14"; Photo - 4" x 6"; Letter - 8.50" x 11"; DL Envelope - 4.30" x 8.60"; B5 (JIS); ISO B5; A6 - 4.10" x 5.80"; Universal; A5 - 5.80" x 8.30"; A4 - 8.30" x 11.70"; B5 - 6.90" x 9.80"; Ofuku Hagaki; C6 Envelope - 4.50" x 6.37"; C5 Envelope - 3.37" x 9"; L; 2L; Custom Size; 2.99" x 4.02"; 3" x 5"
Get exceptional performance with fast mobile print speeds and cartridges that let you print more pages than other in-class cartridges.3 4 Reduce interruptions with fewer supplies replacements and a long battery life. ap1122: I live in a very small apartment and was looking for a multi-function printer with a small foot print. This met the requirements every which way. It works as advertised. Very happy with the purchase! 1 Mobile device needs to support Bluetooth v4.0+ and be enabled. A mobile app such as HP ePrint or HP AiO Remote must be installed and opened for printing. Mobile device must be within 5 feet of the printer. For details, see http://www.hp.com/go/bleprinting. Bluetooth is a trademark owned by its proprietor and used by HP under license. 2 Mobile device needs to be connected directly to the Wi-Fi Direct® signal of a Wi-Fi Direct supported AiO or printer prior to printing. Depending on mobile device, an app or driver may also be required. For details, see http://www.hp.com/go/mobileprinting. Wi-Fi Direct is a registered trademark of Wi-Fi Alliance®. 3 Best-in-class performance claim compares all inkjet color mobile printers as of October 2015 based on market share as reported by Q2 2015 IDC, based on manufacturer’s published specifications.